My stint in Paris this time didn’t include a lot of sightseeing, really. It was my 10th time there so I’ve seen most of it already. I did however manage to see the catacombs, which was a first for me. In addition, Paulina took us to see L’Atelier des Lumières, Paris’ first digital art museum. I also brought La Familia to see the Panthéon again and checked out Montmartre and Sainte Chapelle with visiting friends. A few of us from class also went to see the Notre Dame Light Show (very impressive! ), so I’ve been touristy for about 15 % of the time. I stayed in three different places during my four months in Paris. I had to move around because he apartments I found weren’t available fr four straight months. 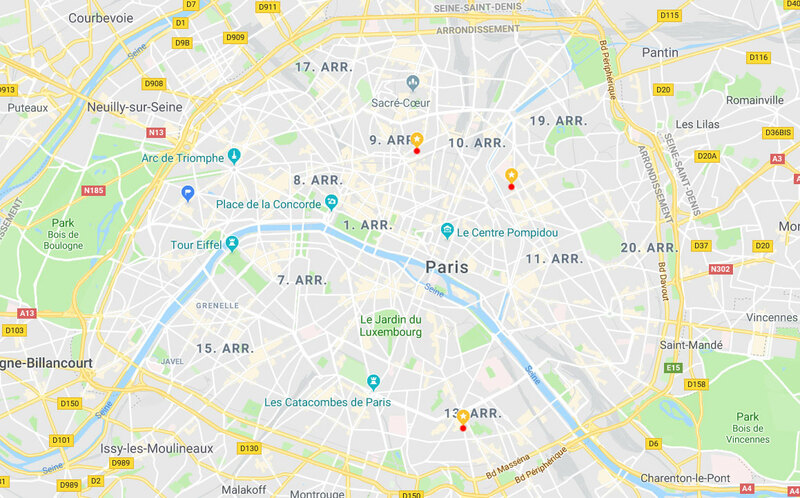 My first apartment was close to the Chinese Quarter (13th arrondissement), close to Place d’Italie and meat I got to take the metro straight past the Eiffel Tower every day on my way to school. That made me really feel like I was living the dream… First day I saw the tower I was amazed, I didn’t realize the metro went by so close to it. Perfect. After this apartment I moved to the 9th arr. but this apartment was too small even for me. Quite uncomfortable and no room for anything at all, so I cancelled it after the mandatory month (you don’t get refunded the first month if you book more than a month on AirBnB for some reason) and moved a slight hop eastwards to the 10th arr. This apartment was amazing, I could’ve lived there permanently. I had visits from Ragnhild, Tia, Rune, Thomas, Janne, La Familia and spent a day with Genevieve and Vincent (who I met on my first safari tour in Africa) AND Michael (who I met on the bus between Kathmandu and Pokhara in Nepal), so this rapidly took over as the country where I experienced the most meetups with old friends. Other than that I spent the time eating croissants and practicing French – trying to let some routine balance the chaos that entered my life this June. I spent a day at the Père Lachaise Cemetery with Michael and did a soppy thing. There was a place there where people had “scratched” the names of loves ones into the dirt and dust of and old grave. I scraped Eysteins name in there, rather clumsily, but at least now his name rests at Père Lachaise… Someone remembered and loved him enough to commemorate him. I don’t want him to be forgotten, so… I choose to reminds myself of the ones I’ve loved and lost in as many ways as I can. It keeps them with me. (And that grave’s never getting cleaned, so he’s gonna be there forever).